LEVERAGING YOUR EMR TO DERIVE VALUE. The User Experience: An Underexploited Opportunity. Ongoing Change: Developing Sustainment. EMR Benefits Don�t Come in a Box: Why Structured Innovation Is Necessary to Realize Strategic EMR Value. Using EMR Data to Improve Clinical Protocols, Outcomes, and Patient Safety. Using the EMR to Achieve Operational Excellence through "Lean" Thinking. 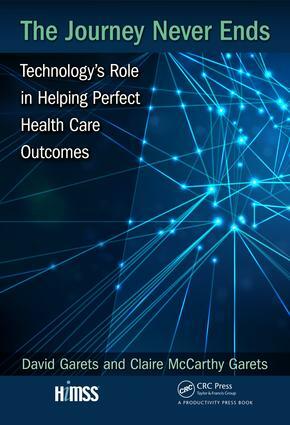 Platform for Innovation, Part I�Maximizing the EMR. EMR Adoption Model Stage 7 Lessons. OTHER IT INFRASTRUCTURE REQUIREMENTS FOR FUTURE INITIATIVES. Interoperability: Enabling Health Care Data Sharing. Business Intelligence Reporting and Analytics: Tools, Resources, and Governance. The Future of Information Security in Health Care. Staffing IT for a Post-Live EMR World. SPENDING MORE ON IT: GOING BEYOND THE SCOPE OF YOUR EMR. The Brave New World of Fee-for-Value Reimbursement. Health Information Exchange Case Study: Implementing a Multicommunity Hospital Set of Solutions on a Budget. Bellin Health: A Model for Population Health. Patient Portals: Enabling Participatory Medicine. Platform for Innovation, Part II�New Technology and Applications. Claire McCarthy Garets, MA, FHIMISS, is an organizational sociologist and an internationally recognized change management and technology adoption strategist. She has more than three decades of experience supporting diverse health care organizations through transformative technology implementations. In addition to her IT work, Claire?s change leadership experience includes mergers, downsizings, and reorganizations. Claire is the CEO of Change Gang, LLC, a boutique healthcare change management consulting firm. She specializes in transformational leadership development; supports HCOs in electronic medical record planning, implementation, and optimization; and advises IT companies. She earned an MA in sociology from the University of Montana.